Filipino Workers Needed in Canada - Gateway to Canada | Canada Immigration Consultancy! 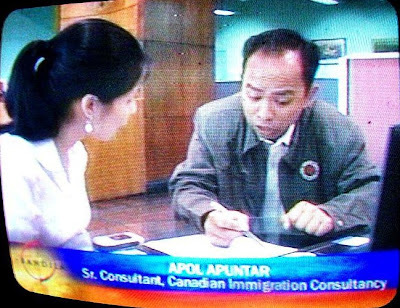 Yesterday night, ABS-CBN'S late night news show, Bandila, featured about opportunities for Filipino workers to work in Canada. Ambassador Jose Brillantes said that Filipino Workers are preferred by Canadian employers who are hiring foreign workers because of their dedication to work and language proficiency. About 32,000 Filipino workers are needed in Canada according to the ambassador! Meanwhile, Apples Jalandoni reported about the application process to work in Canada. She went to Philippine Overseas Employment Agency, where she got the list of registered recruitment agencies like our partner, International Jobs Recruitment Agency. She also visited our office to inquire about the immigrant visa application to Canada. If you failed to watch the report last night, a video clip is available here. Ambassador Brillantes suggested filing the application at Canadian Visa Office in other countries where the processing is faster like Singapore. Processing period varies from one Visa Office to another primarily depending on the number of application it receives for processing. Click here for the current application processing times.